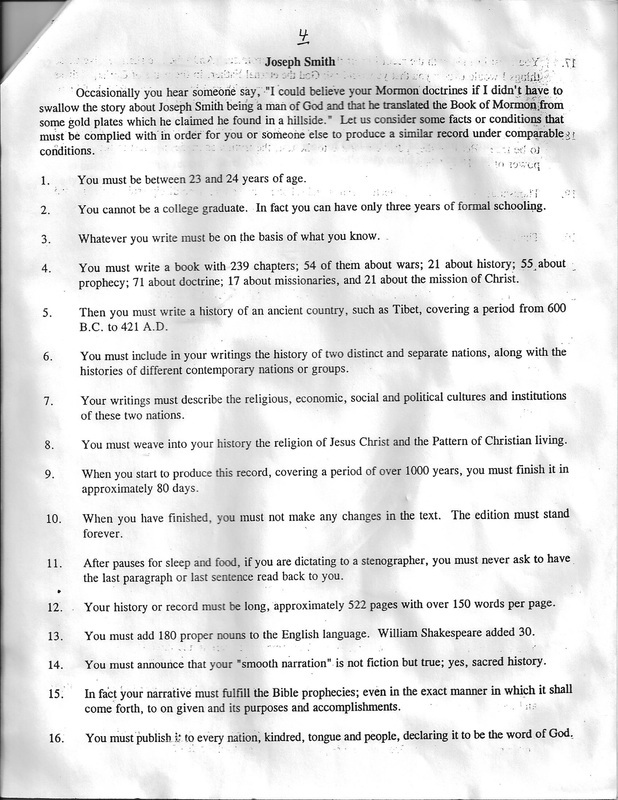 On the evening of Christmas 2015 I found this document (scans at bottom) in my grandparents' basement in Milo, Idaho. Google turned up nothing about it, not even whether the protagonist had actually existed, and they didn't know where it came from or who wrote it. I didn't know whether the story was true or not but in either case I was very surprised that I'd never heard of it before. It seemed too good to be true but some of the details were plausible and there are other, factual accounts of scholars being converted after studying the Book of Mormon academically. With the disclaimer that I couldn't vouch for its veracity and that it seemed heavily embellished at the very least, I transcribed and posted it here and then shared it asking if anyone knew anything about it. I figured that if this speech actually took place there should be people still living who remembered it. Christopher Cunningham informed me that it was first published in the August 1959 Te Karere, a publication of the New Zealand Mission, and in November republished in South Africa's Cumorah's Southern Messenger with minor typographical changes. 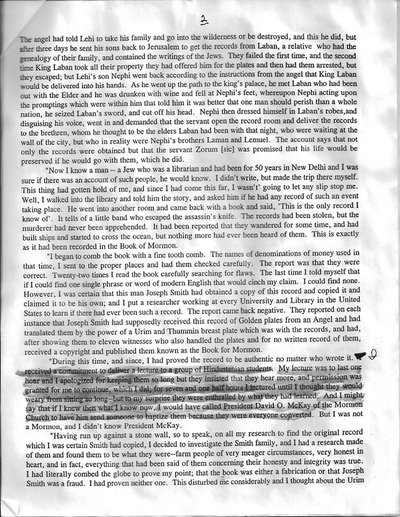 Later copies like this one seem to be copied from the Southern Messenger version." Dave Burrell and Charles Steinman both directed me to this Masters' thesis which on page 40 claims that James R. Sarver (this version apparently misspells his name) was a real person but the story was a sham. 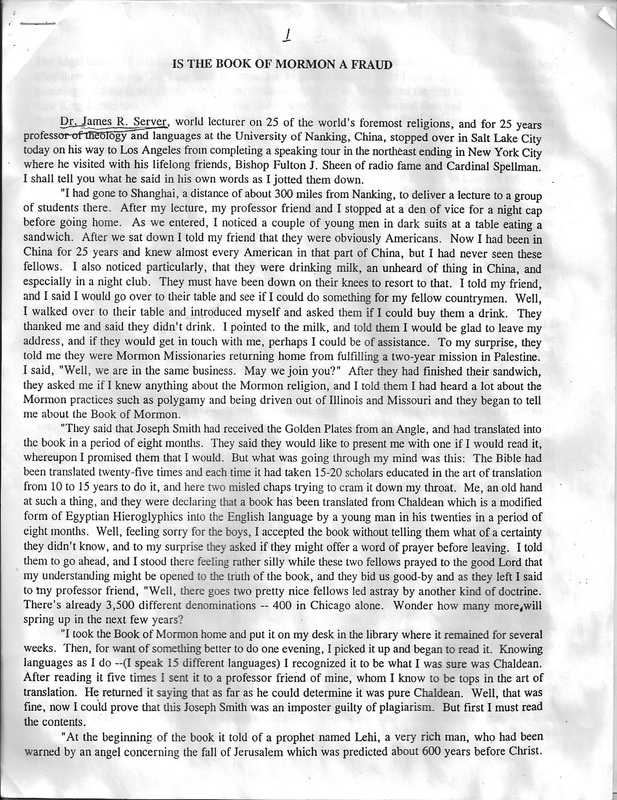 A message to wards and stakes in The Priesthood Bulletin of September-October 1967 read in part, "Mr. Sarver's so-called testimony is alleged to be a complete fabrication and must not be used by missionaries or others representing the Church. He is alleged to be apostate from the Church and has allegedly allied himself with apostate polygamist cults. 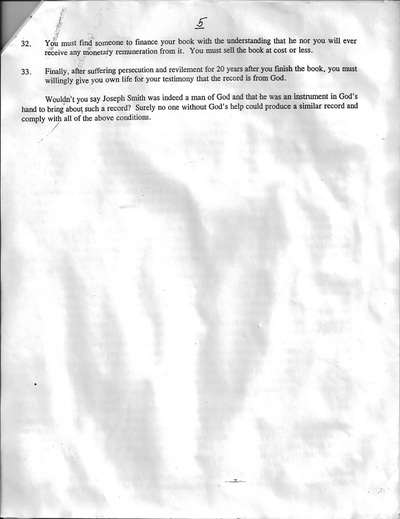 Members should be warned against the obvious hoax which Mr. Sarver has attempted to perpetrate upon the Church and its members." Dr. James R. Server, world lecturer on 25 of the world's foremost religions, and for 25 years professor of theology and languages at the University of Nanking, China, stopped over in Salt Lake City today on his way to Los Angeles from completing a speaking tour in the northeast ending in New York City where he visited with his lifelong friends, Bishop Fulton J. Sheen of radio fame and Cardinal Spellman. I shall tell you what he said in his own words as I jotted them down. “I had gone to Shanghai, a distance of about 300 miles from Nanking, to deliver a lecture to a group of students there. After my lecture, my professor friend and I stopped at a den of vice for a night cap before going home. As we entered, I noticed a couple of young men in dark suits at a table eating a sandwich. After we sat down I told my friend that they were obviously Americans. Now I had been in China for 25 years and knew almost every American in that part of China, but I had never seen these fellows. I also noticed particularly, that they were drinking milk, an unheard of thing in China, and especially in a night club. They must have been down on their knees to resort to that. I told my friend, and I said I would go over to their table and see if I could do something for my fellow countrymen. Well, I walked over to their table and introduced myself and asked them if I could buy them a drink. They thanked me and said they didn't drink. I pointed to the milk, and told them I would be glad to leave my address, and if they would get in touch with me, perhaps I could be of assistance. To my surprise, they told me they were Mormon Missionaries returning home from fulfilling a two-year mission in Palestine. I said, “Well, we are in the same business. 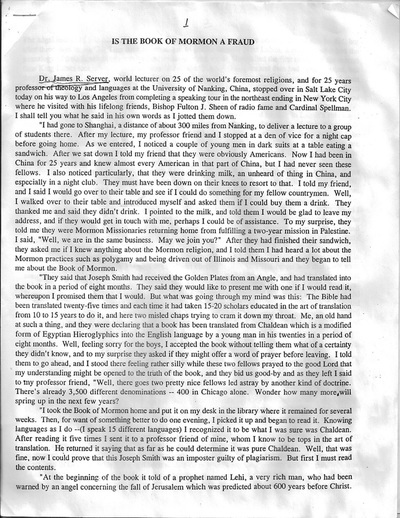 May we join you?” After they had finished their sandwich, they asked me if I knew anything about the Mormon religion, and I told them I had heard a lot about the Mormon practices such as polygamy and being driven out of Illinois and Missouri and they began to tell me about the Book of Mormon. “They said that Joseph Smith had received the Golden Plates from an Angle [sic], and had translated into the book in a period of eight months. They said they would like to present me with one if I would read it, whereupon I promised them that I would. But what was going through my mind was this: The Bible had been translated twenty-five times and each time it had taken 15-20 scholars educated in the art of translation from 10 to 15 years to do it, and here two misled chaps trying to cram it down my throat. Me, an old hand at such a thing, and they were declaring that a book has been translated from Chaldean which is a modified form of Egyptian Hieroglyphics into the English language by a young man in his twenties in a period of eight months. Well, feeling sorry for the boys, I accepted the book without telling them what of a certainty they didn't know, and to my surprise they asked if they might offer a word of prayer before leaving. I told them to go ahead, and I stood there feeling rather silly while these two fellows prayed to the good Lord that my understanding might be opened to the truth of the book, and they bid us good-by and as they left I said to my professor friend, “Well, there goes two pretty nice fellows led astray by another kind of doctrine. There's already 3,500 different denominations – 400 in Chicago alone. Wonder how many more will spring up in the next few years? “I took the Book of Mormon home and put it on my desk in the library where it remained for several weeks. Then, for want of something better to do one evening, I picked it up and began to read it. Knowing languages as I do – (I speak 15 different languages) I recognized it to be what I was sure was Chaldean. After reading it five times I sent it to a professor friend of mine, whom I know to be tops in the art of translation. He returned it saying that as far as he could determine it was pure Chaldean. Well, that was fine, now I could prove that this Joseph Smith was an imposter guilty of plagiarism. But first I must read the contents. “At the beginning of the book it told of a prophet named Lehi, a very rich man, who had been warned by an angel concerning the fall of Jerusalem which was predicted about 600 years before Christ. The angel had told Lehi to take his family and go into the wilderness or be destroyed, and this he did, but after three days he sent his sons back to Jerusalem to get the records from Laban, a relative who had the genealogy of their family, and contained the writings of the Jews. They failed the first time, and the second time King Laban took all their property they had offered him for the plates and then had them arrested, but they escaped; but Lehi's son Nephi went back according to the instructions from the angel that King Laban would be delivered into his hands. As he went up the path to the king's palace, he met Laban who had been out with the Elder [sic] and he was drunken with wine and fell at Nephi's feet, whereupon Nephi acting upon the promptings which were within him told him it was better that one man should perish than a whole nation, he seized Laban's sword, and cut off his head. Nephi then dressed himself in Laban's robes, and disguising his voice, went in and demanded that the servant open the record room and deliver the records to the brethren, whom he thought to be the elders Laban had been with that night, who were waiting at the wall of the city, but who in reality were Nephi's brothers Laman and Lemuel. The account says that not only the records were obtained but that the servant Zorum [sic] was promised that his life would be preserved if he would go with them, which he did. “Now I know a man – a Jew who was a librarian and had been for 50 years in New Delhi and I was sure if there was an account of such people, he would know. I didn't write, but made the trip there myself. This thing had gotten hold of me, and since I had come this far, I wasn't' [sic] going to let any slip stop me. Well, I walked into the library and told him the story, and asked him if he had any record of such an event taking place. He went into another room and came back with a book and said, 'This is the only record I know of'. It tells of a little band who escaped the assassin's knife. The records had been stolen, but the murderer had never been apprehended. It had been reported that they wandered for some time, and had built ships and started to cross the ocean, but nothing more had ever been heard of them. This is exactly as it had been recorded in the Book of Mormon. “I began to comb the book with a fine tooth comb. The names of denominations of money used in that time, I sent to the proper places and had them checked carefully. The report was that they were correct. Twenty-two times I read the book carefully searching for flaws. The last time I told myself that if I could find one single phrase or word of modern English that would cinch my claim. I could find none. However, I was certain that this man Joseph Smith had obtained a copy of this record and copied it and claimed it to be his own; and I put a researcher working at every University and Library in the United States to learn if there had ever been such a record. The report came back negative. 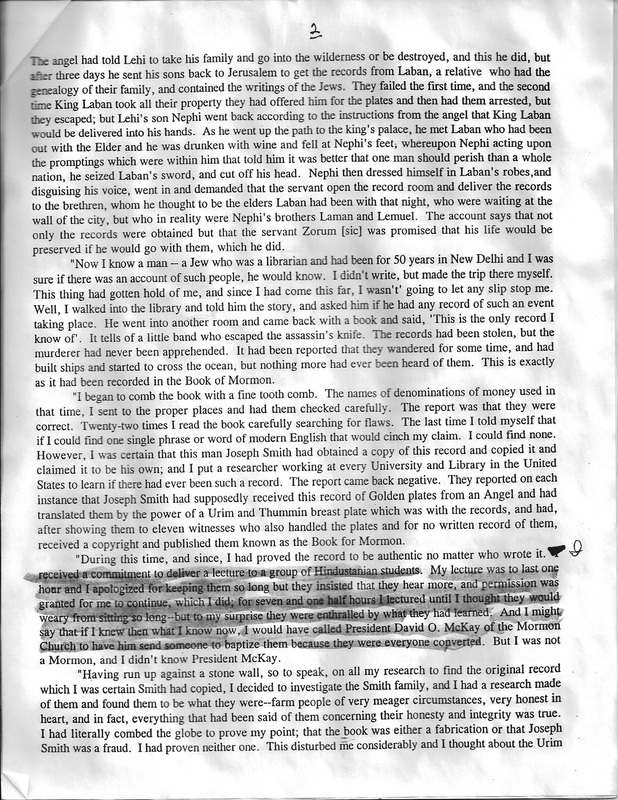 They reported on each instance that Joseph Smith had supposedly received this record of Golden plates from an Angel and had translated them by the power of a Urim and Thummim breast plate which was with the records, and had, after showing them to eleven witnesses who also handled the plates and for no written record of them, received a copyright and published them known as the Book of Mormon. “During this time, and since, I had proved the record to be authentic no matter who wrote it. I received a commitment to deliver a lecture to a group of Hindustanian students. My lecture was to last one hour and I apologized for keeping them so long but they insisted that they hear more, and permission was granted for me to continue, which I did, for seven and one half hours I lectured until I thought they would weary from sitting so long – but to my surprise they were enthralled by what they had learned. And I might say that if I knew then what I know now, I would have called President David O. McKay of the Mormon Church to have him send someone to baptize them because they were everyone converted. But I was not a Mormon, and I didn't know President McKay. “This was the final test. In my capacity I had always been a praying man, so each day I prayed for knowledge as to whether this book had been brought forth through divine power. I prayed for several weeks, and I assure you I still doubted the Smith story of having been given the gold plates by an Angel, from which they were translated. Then I thought now maybe the Lord wasn't pleased with some of my vices. Maybe if I put myself in a more humble state of contriteness, I would get an answer, and although I had never been a large imbiber, I did like my night-caps and I did enjoy my cigar and pipe. I thought about these things, and decided that if I wanted to do penance, I know of nothing more tragic than to deprive myself of the pleasure of my cigar and highballs once in a while. But I had come this far and finally I decided I would leave off the night-cap and my cigar and pipe, and put myself in the hands of God. I was taking him at His word, and if doing this would bring results, I would try. 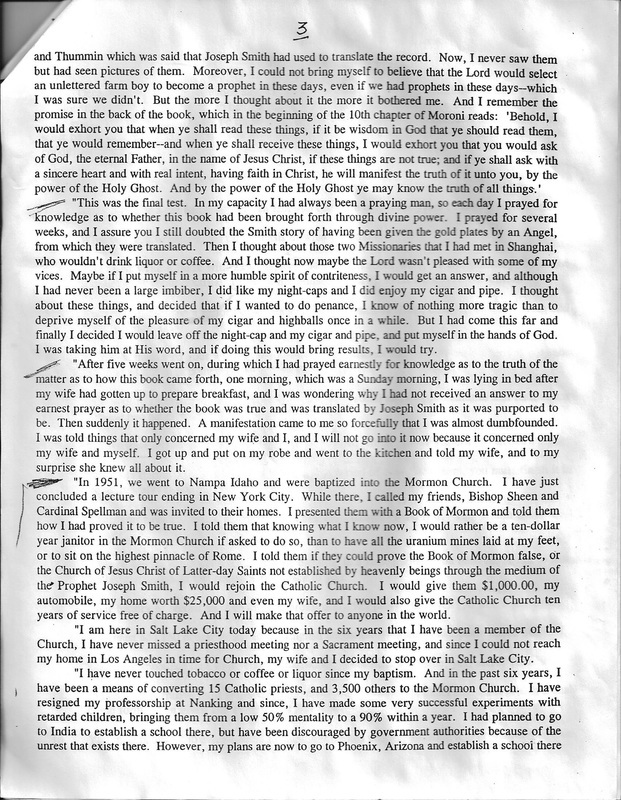 “After five weeks went on, during which I had prayed earnestly for knowledge as to the truth of the matter as to how this book came forth, one morning, which was a Sunday morning, I was lying in bed after my wife had gotten up to prepare breakfast, and I was wondering why I had not received an answer to my earnest prayer as to whether the book was true and was translated by Joseph Smith as it was purported to be. Then suddenly it happened. A manifestation came to me so forcefully that I was almost dumbfounded. I was told things that only concerned my wife and I, and I will not go into it now because it concerned only my wife and myself. I got up and put on my robe and went to the kitchen and told my wife, and to my surprise she knew all about it. “In 1951, we went to Nampa Idaho and were baptized into the Mormon Church. 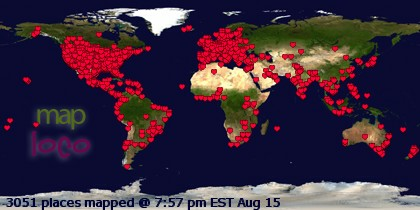 I have just concluded a lecture tour ending in New York City. While there, I called my friends, Bishop Sheen and Cardinal Spellman and was invited to tour their homes. I presented them with a Book of Mormon and told them how I had proved it to be true. I told them that knowing what I know now, I would rather be a ten-dollar year janitor in the Mormon Church if asked to do so, than to have all the uranium mines laid at my feet, or to sit on the highest pinnacle of Rome. I told them if they could prove the Book of Mormon false, or the Church of Jesus Christ of Latter-day Saints not established by heavenly beings through the medium of the Prophet Joseph Smith, I would rejoin the Catholic Church. I would give them $1,000.00, my automobile, my home worth $25,000 and even my wife, and I would also give the Catholic Church ten years of service free of charge. And I will make that offer to anyone in the world. “I am here in Salt Lake City today because in the six years that I have been a member of the Church, I have never missed a priesthood meeting nor a Sacrament meeting, and since I could not reach my home in Los Angeles in time for Church, my wife and I decided to stop over in Salt Lake City.